The Contributions tab for each TB/WG/ISG displays the most recent Contributions in the body selector. UID: this is a Unique IDentifier used to identify contributions. Status: the contribution state machine page list the possible states and their position in the workflow. Meeting: meeting to which the contribution is linked. If more than one meeting, then only the first allocated one is displayed. Note: Clicking on a column header will change the displayed sort order. Any Contribution that is available can be downloaded by clicking on its ID. Note: Users must login to the portal to accessing a file for download. 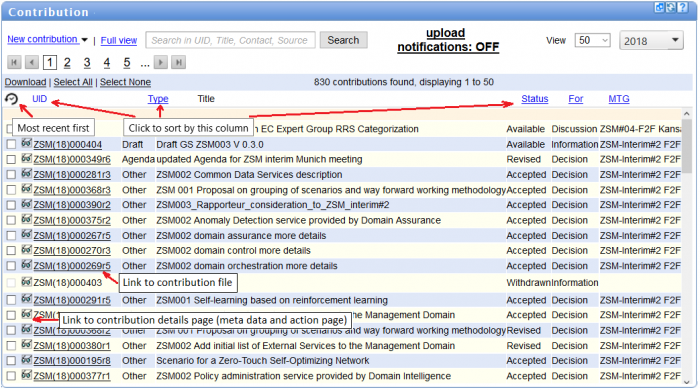 When logged onto the portal, it is possible to download contributions in a zip file containing several documents. To do so, select one or several available contributions and click on the Download link. This button links to the contribution main screen, displaying the same list of contributions than in the portlet view. The number of contributions displayed on each page can be 20 (default), 40, 60, 80, 100 and all contributions. Navigation between pages can be performed by clicking on Previous and Next links at the bottom of the page.